Maurizio Sarri accepted that his Chelsea players are still struggling to show a consistently tough mentality after seeing the Blues beaten 2-0 by Everton at Goodison Park. 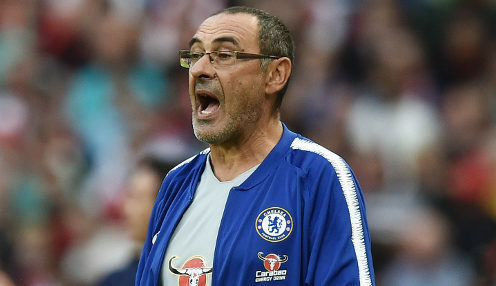 The Italian head coach has voiced his concerns about the same problem on several occasions this season, and Sarri was again to play down suggestions that the defeat was due to tactical issues. The problem was mental on the pitch, so the system and the tactics are not important. He told reporters: "We played probably the best 45 minutes of the season and then suddenly at the beginning of the second half we stopped playing - I don't know why. "The situation was clear, it's clear the problem is not a physical problem - if it was physical you would go down gradually, not in one second. It's probably a mental block. "The problem was mental on the pitch, so the system and the tactics are not important. And it wasn't about motivation because we started very well. "We have to play eight matches now and we have to fight for our possibilities." The reverse on Merseyside left the Londoners three points adrift of the top four, with Arsenal, Tottenham Hotspur and Manchester United all involved in a four-way battle for a Champions League spot. Chelsea could also qualify for that competition by winning the Europa League, in which they have reached the quarter-finals and been drawn to face Slavia Prague. The Blues are available at 6/4 to win the Europa League, while they can be backed at 10/11 to finish in the top four in the Premier League. Meanwhile, Arsenal are 10/11 to earn a top-four spot and 5/2 to claim Europa League glory.